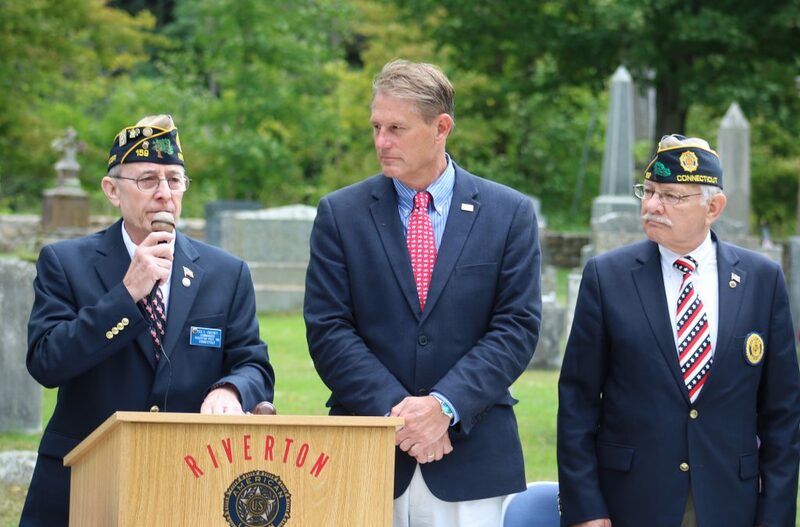 RIVERTON – On Saturday, September 22nd, State Representative Bill Simanski (R-62) participated in a ceremony to unveil a new government white marble headstone for deceased World War One veteran Leon Starr Bunnell. Previously, the gravesite at the Riverside Cemetery in Pleasant Valley had been unmarked since Bunnell’s death in 1959. Riverton American Legion Post 159 worked with Bunnell’s descendants for 4 years to track down the appropriate documentation and apply for the headstone. The ceremony was organized by Riverton American Legion Post 159 and Post Commander Ted Sweeney led the dedication. The headstone was unveiled by Vice-Commander Ed Tibbets, the memorial wreath was placed by Girl Scout Troops #40181 and #40085, Taps was played by Post 159 Bugler Robert Angus and Amazing Grace was played by Post 159 Piper Leah Ward. Guest speakers included Barkhamsted Selectman Ray Pech, State representative Bill Simanski, State Senator Kevin Witkos, American Legion National Executive Committeeman Joseph Jackson and Commander of the American Legion Department of Connecticut Tom Flowers.